The article provides information about the conditions of labor of Ukrainian workers in Germany in contrast to the promises of German recruiting propaganda. The recruiters offered the workers employment according to skill, good living conditions and excellent wages. But in Germany all city workers were kept prisoners behind the barbed wire and in horrible living and sanitary conditions. 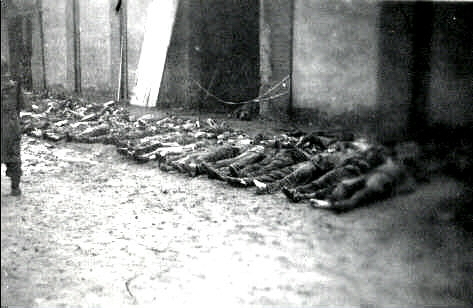 The supervisors treated the workers from the East brutally. Many workers died from continuous under nourishment, difficult working conditions, sickness or allied bombs. The author gives many facts about the fate of the Ukrainian intelligentsia from central Ukraine and names many individuals from Kiev and Kharkiv. Hi: I was a Capt, Company Commander in 1st Bn. 405th Inf Regt of the 102nd Inf. Div. I recognize your pictures as I have some like them . This is at Gardelegen, Germany. This buillding is not part of a camp. This is a barn out side the town. The Germans had been marching these POWS for weeks to keep them from the Russians. When they met the USA troops, they put them all in this barn with straw about a foot deep on the floor. Then they fired a very pistol into the barn and set the straw on fire. The POWs could not get out and were killed. When we opened the barn door, it was a horrible site. Bodies were 10 feet high at the door where they died trying to get out. We found them on the 18th of April 1945. Our Div Commander made all the town people go to see this sight. Made them take the bodies out of the barn as you see in your pictures and later to bury them. Best wishes. John H. Middlebrooks, LTC USA Retired, Mon, 31 Mar 2003. The prisoners at the Ahlem Labor Camp were initially in the Lodz (Litzmannstadt) Ghetto in Poland. From there, they were deported to the Auschwitz Concentration Camp for a short period of time, and finally sent to Hanover, Germany and the Ahlem Labor Camp. On July 1936 handed over the Burbach AG pit Prince Hall free of charge to the Wehrmacht, which the army ammunition depot (mine). 1937 began extensive construction in the east adjoining woodland. There was around 30 hectares, the production area of the institution. To this end, various structures have been built, including five large warehouses, ammunition workhouses, barracks and various other operational and. The building of the shaft were for the new task and expanded. 1941 could be the work finally completed. The product range of Muna comprised mainly grenades and launchers 8 cm 10 cm tank shells. Underground are on the 550 and the 650 m level storage chambers for been with a total capacity of 10,000 tons of ammunition created. As early as August 1938 began the storage here. During the operating period, there were various explosion accidents both underground as well as above-ground area. The most serious occurred on 28 Juni 1941. Right on the mouth hole of the shaft while two people were killed and another three were injured. Several hundred foreign and forced laborers have been used for the construction and operation of the system. At the existing operating areas adjacent barracks have been erected for the accommodation. It should have passed three separate storage areas. On 9 April 1945 conquered associations of the U.S. Army occupied the area around Ahrbergen and also the ammunition depot. The following is my grandmother's story. She was born in (or near) Ternopil, Poland (pre-WWII) in what is today western Ukraine. My grandmother was forcibly taken from her home by the German army at the start of WWII. She was born in 1913, so she would have been around 25 years old when this tragedy occurred! She was forced to work at a labour camp somewhere in Germany under the most abominable, deplorable conditions imaginable for the next 6 to 7 years of her life. Many "inmates" did not survive the camp. The irony of this story is that one person who treated her with respect and love during this horrific period was a German guard at the labour camp! A family source reluctantly told me that they were in love. Apparently, this unnamed guard risked his life to secretly feed, cloth and care for many of the inmates, which not only included Poles, but also Ukrainians, Jews and Gypsies. Another family source informed me that my grandmother was also involved with helping Jewish inmates escape the camp. Whether all this is fact or fiction remains to be learned. My mother, Theresa, was born of this relationship after the war in 1945. Sadly, my grandfather was executed (shot) shortly after my mother was born for stealing food to feed his family! Survivors on my mother's side of the family either do not have any information, or more likely, are keeping this "embarassing" chapter of my grandmother's hard life a secret. This resistance has made me even more steadfast in learning more about him. I recently contacted the Augsburg registry office (Standesamt Augsburg) for my mother's papers. Unfortunately, there's no mention of my grandfather's name in any of the documents. Millions of Ukrainians perished in Auschwitz; but history only records that a few Ukrainians sided with the Nazis. "...his greatest tormentor in Birkenau was a Jewish kapo in Block 4 who beat him mercilessly whenever he caught him praying. That man hated Father Kovalskyi because he was Ukrainian and a priest. He did not care that Kovalskyi was there because he had tried to help Jews." 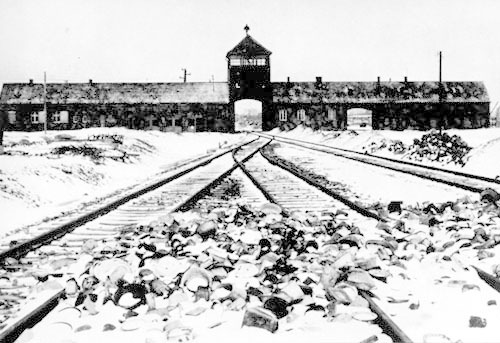 "I stayed in Barracks 7 at Birkenau for about another week. It was a mixed barracks, housing Jews, Poles, and Ukrainians, all of them trying to survive. After the first week, we were marched over to Block 11 in old Auschwitz. There were 29 of these blocks in all. They had been used as housing for Polish border troops before the war. Each one had two accommodation levels and a small attic above. We were on the top floor, which was almost entirely populated by Ukrainians. I notice that there were quite a few more SS men here guarding us. There were also quite a few Jewish kapos, dressed in black outfits, better fed than the rest of us, who did a lot of killing. Many of them belonged to a special formation known as the "Canada Commando" which sorted out the belongings of incoming prisoners, taking everything that was of value to the Third Reich's war economy, leaving only the naked men, women and children, many of whom were then gassed. That task gave those kapos many opportunies to steal, which they did, not that it helped most of them in the long run. "I remember that there were this time a lot of Soviet POWs in the camp, including a large group of Ukrainian women. They were housed in Block 11, two floors below us. We could sometimes hear them singing Ukrainian songs at night. That went on for about three weeks, and then one night their singing abruptly stopped. We heard the next day that they had all been taken away and shot. Only the empty cellar floor and an echo of their songs were left in our minds." "Approximately 400,000 people were registered and placed in the camp and its sub-camps (200,000 Jews, more than 140,000 Poles, approximately 20,000 Gypsies from various countries, more than 10,000 Soviet prisoners of war, and more than 10,000 prisoners of other nationalities)." Notice how the Auschwitz museum doesn't mention the millions of Ukrainians who were slaughtered in Auschwitz. Thank them for airbrushing history to color it the way they want it to look. 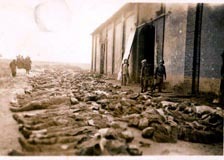 Over 50% of the registered prisoners died as a result of starvation, labor that exceeded their physical capacity, the terror that raged in the camp, executions, the inhuman living conditions, disease and epidemics, punishment, torture, and criminal medical experiments. I was just a teenager in western Ukraine when World War II broke out. The Soviets came claiming they would liberate us. Instead they began liquidating us. The Germans drove them out. They also said they had come to free us from the Bolsheviks. Then they began to execute us, to exploit us, even to export us as slave laborers to the Third Reich. Too many people still bury Ukraine's losses among those of the Soviet Union or Poland. They pretend Ukrainians did not exist. We proved otherwise. We resisted. Ukraine's anti-Nazi and anti-Soviet movement would carry on an armed struggle for our people's freedom well into the 1950s. People forget all that. When they speak of Ukrainians and the war, they refer to us only as collaborators or camp guards. I was in a camp, in fact several. But I wasn't there as a guard. In fact, that's where I got my number. It's 154754. The Nazis gave it to me. I was 19 years old when they did that to me at Auschwitz. They brought me there because I was a member of the Organization of Ukrainian Nationalists. I know it has become politically correct to label Ukrainian nationalists as anti-Semitic Nazi collaborators. That is not true. Yes, there were some Ukrainians who collaborated, out of fear, out of greed, out of prejudice. But I saw such scum among every nation represented among those at Auschwitz. I also saw them in the other concentration camps the Nazis carted me off to, including Mathausen, Melk and Ebensee. Many Ukrainian patriots, men and women, perished at the hands of the Nazis. Only a few were lucky enough to survive and to find a new life in the West, even as our homeland fell under Soviet occupation, again. A Ukrainian soldier in the Soviet ranks recalls liberating Auschwitz, "When we entered the camp, we gasped: barbed wire everywhere, everyone in striped clothes and caps. The prisoners could barely walk: they looked like shadows or ghosts, they were so skinny. Some could not even move, others were supported by friends. They tried to talk to us, but we could not understand them: there were people from different countries, including many Jews from France, Poland and even Palestine. At the time of our assault there were 7-10,000 people in the camp - I learned after the war that the Germans had earlier shipped hundreds of thousands of prisoners to Germany and continued to use them for forced labour. But those left behind were barely alive. At first, when they saw us, they could not believe they were free. But when they understood, some began to laugh, others broke down crying. Many tried to kiss us, but they looked so horrible that we kept away so as not to catch some bug. Many asked for food, but we didn't have any. Our support units arrived the next day and got busy with the prisoners, feeding and washing them. But we only stayed for a couple of hours. It was a horrible scene. We went into a filthy women's barrack, with bunks in tiers and bloodstains on some of them. The Germans had not expected everything would move so fast: we carried out the operation very quickly. They hadn't had time to blow up anything or plant mines. There was a huge construction site next to the camp: prisoners were building a chemicals plant. There were not just camp inmates working there, but also tens of thousands of civilians shipped from the USSR. The grim barracks stood in rows and, from a distance, looked like a factory - and it was a real factory of death. I saw a great deal in the war, but nothing so horrible or awesome as that camp. The experience gave us a new energy and determination to put an end to the abomination of nazism. Our men did not spare their lives - we knew our cause was just. In a few days we moved on to the west, and I was again gravely wounded, now on German territory, at a place called Lonau. "You expect us to eat this slop with worms in it?" "You should be so grateful," he says, "when I was in the Russian prisons in the first World War, I had it worse than you. I didn't even have a worm to eat. At least you've got a worm not to mention soup." ...[When assigned to peel vegetables,] we craved to have some of these vegetables but weren't allowed. I'd be wearing my big jacket as it was already cold outside....I'd look around and thought to myself is it worth the risk getting caught taking a vegetable. [The penalty was being moved to Buchenwald concentration camp.] I kept a watchful eye on the guard. When she wasn't looking, I quickly grabbed a carrot and put it in my pocket...I managed to swipe some turnips along the way to the fields as we walked through."